When I began writing the post, There’s More to Fire Than Heat, Fuel and Oxygen (or, Fire Exists Within a Sphere of Changing and Interdependent Circumstances), I wanted a basic model to represent fire. 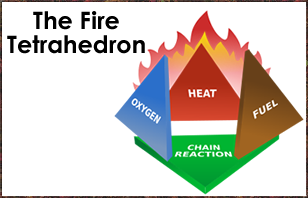 There is actually already a model commonly used to represent fire known as the tetrahedron of fire. It consists of a tetrahedron of course, which is a pyramid with 3 sides and a bottom. The three sides represent one each of HEAT, FUEL and OXYGEN. The bottom of the pyramid represents the circumstances under which those three elements interact and is commonly referred to as a chain reaction. The common explanation of the tetrahedron is that if you remove any one of the factors represented by the four sides, the fire ceases, which is true. I have never felt comfortable with this common model, and indeed part of the impetus for writing that first article was to emphasize the importance, to my way of thinking, of the circumstances which allow, inhibit, and shape the character of, a fire; In other words, to draw what I feel is rightful attention to the bottom of the pyramid. What I ended up writing instead, or before I got to my point, was the epic analysis that follows! I decided that I better just cut it out and use it somewhere else. Lucky you.